The CLI-42 REdSETTER has finally arrived thanks to the hard work of our German manufacturing partners. As with preceding REdSETTER models, they have reproduced the same level of quality components and reliability. These units reset the Canon OEM cartridge chips back to their "full" state, providing cartridge refillers with the means to refill their original cartridges while retaining the all important ink monitoring system. Equally important, the older prism tech is also retained providing an additional safeguard against unexpected ink loss from the spongeless part of the cartridge. Overall the resetter provides refillers with considerably more confidence in their cartridges contents while reducing the likelihood of running cartridges dry and damaging the expensive Pro-100 printhead. Following more than three successful years partnership with the REdSETTER brand we are happy to provide a two year warranty on these units allowing you to share in our confidence that you'll be receiving a resetter that is well designed, resilient and will, thanks to its USB power source, allow you to reset, time after time, without issue. Plug the unit cable into the unit socket and an available USB socket (for power). 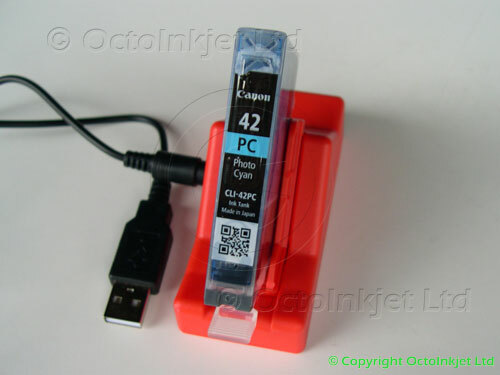 Tip: Your printers front "Pictbridge" socket can power this printer too (if the printer is powered on). Slot your cartridge into the guiding grooves (chip facing down) so that the pins make contact with your cartridge chip. Tip: A switch in the cartridge path activates the reset process. Wait for a single short red LED blip followed by a longer LED burst. Your cartridge chip should now be reset to full. Tip: We recommend you reset your chip BEFORE you refill your cartridge to avoid any ink spills during resetting. Instructions: Printed (included), Online video guide to follow. OctoInkjet are offering an extra year on the standard one year warranty due to the brands established track record and our confidence in the product. A battery version of the CLI-42 resetter will not be available. Rumours that the CLI-42 cartridge chips have a "fusible link" that causes the chips to cease functioning are unsubstantiated and based on a "What if..." forum discussion. These units are on sale for £29.95 until the first 30 units are sold..
Standard 1-year manufacturers warranty + 1 extra year provided by OctoInkjet Ltd. The warranty covers standard use with OEM/Original CLI-42 cartridge chips using a standard voltage USB connection. We can't accept warranty claims based on user modifications, incorrectly powered USB sockets, etc. "Today I refilled my Canon Pro 100 for the first time and used the resetter-it could not be easier to use. Worked perfectly! USB resetter much more reliable than a battery powered one. Pays for itself, must have if you are doing your own refilling."